President Bush on Wednesday blistered Cuba's regime and challenged the international community to help the people of the communist island shed Fidel Castro's rule and become a free society. "Now is the time to support the democratic movement growing on the island," Mr. Bush said in an address at the State Department. "Now is the time to stand with the Cuban people as they stand up for their liberty. And now is the time for the world to put aside its differences and prepare for Cubans' transition to a future of freedom and progress and promise." 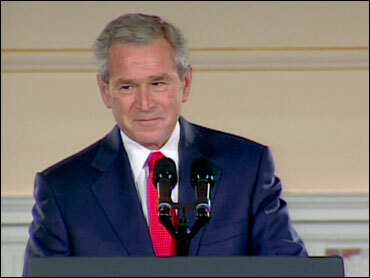 "The dissidents of today will be the nation's leaders," Mr. Bush added. "And when freedom finally comes, they will surely remember who stood with them." In his first major address on Cuban policy in four years, Mr. Bush sought to refocus world attention on Cuba's repressive life. He spoke of citizens there who have no freedom of employment or expression, who live in dire circumstances, and who cannot read books and magazines without approval of the state. "Mr. Bush's speech on Cuba, which included two new policy proposals, was directed at the Cuban people, but, more importantly, to the Democrat-led U.S. Congress, which might be more inclined to begin lifting of the embargo as Fidel Castro's health deteriorates," said CBS News foreign affairs analyst Pamela Falk. "The most important message that the president delivered - one that will surely be the most antagonistic to the Castro brothers - was a message to the Cuban military, to ordinary Cubans, and to Cuban children, that they will have a choice when Castro is no longer on the scene, and that the day of change is coming soon," said Falk. "As with all totalitarian systems, Cuba's regime no doubt has other horrors still unknown to the rest of the world," Mr. Bush said. "Once revealed, they will shock the conscience of humanity, and they will shame the regime's defenders and all those democracies that had been silent." Beyond his immediate audience of diplomats and analysts, Mr. Bush sought to reach out to directly to Cuba's people  part of a clear drive to rally pro-democracy elements. To ordinary Cubans, he said: "You have the power to shape your own destiny. You can bring about a future where your leaders answers to you." Mr. Bush even appealed to the Cuban military, saying: "You may have once believed in the revolution. Now you can see its failure." To the school children of Cuba, Mr. Bush said, "Do not believe the tired lies you are told about America. We want nothing from you except to welcome you to the hope and joy of freedom. Do not fear the future." In total, Mr. Bush's address amounted to no shift in U.S. policy, and only modest proposals that were sure to be rejected by the Castro regime. Those included the offer of expanded Internet access to Cuban students, and an invitation to Cuban youth to join a scholarship program. He also called on the creation of the international fund, built on foreign donations, to help Cuba built a free-market society one day. The broader mission for Mr. Bush  as it has been for years  was to hasten the day when Castro is gone. The ailing leader, 81, who has ruled over Cuba's one-party government for nearly a half-century, has not been since in public since ceding power to his 76-year-old brother, Raul, in July 2006. White House aides insisted there was no specific reason for the timing of Mr. Bush's speech. But it comes less than a week before the United Nations General Assembly takes up Cuba's annual resolution to eliminate the U.S. embargo against the island. For the past 15 years, the world body has overwhelmingly approved a resolution calling for the U.S. economic and commercial embargo against Cuba to be repealed "as soon as possible." The United States has no diplomatic relations with Cuba, lists the country as a state sponsor of terrorism, and has long sought to isolate it through travel restrictions and a trade embargo. The White House sees Castro's failing health as an opening for change, although little is different under Raul Castro. And now Mr. Bush faces increasing pressure from a Democratic-run Congress to amend the U.S. approach. Mr. Bush, without mentioning either Castro by name, said the United States will not seek accommodation with "a new tyranny." "For Cuba's ruling class, its grip on power is more important than the welfare of its people. Life will not improve for Cubans under their current system of government," Mr. Bush said. "It will not improve by exchanging one dictator for another." "The operative word in our future dealings with Cuba is not stability," the president added. "The operative word is freedom." Members of Cuba's small organized opposition are better known outside than inside the country. None of the dissident leaders has any kind of significant following on the island, except for Oswaldo Paya, founder of Cuba's Christian Liberation Movement and promoter of the Varela Project, a pro-democracy signature gathering effort that the government later shelved. Over the years, the U.S. government has spent many millions of dollars to support Cuba's opposition, with much of the funds never directly reaching the dissidents on the island and instead winding up funding opposition support organizations in Miami and Washington.